Almost 20 years after the last update, the Trump administration has released a new plan for how the federal government will work to reduce lead poisoning in children around the country. But some experts on lead say the plan is weak and doesn't lay out specific plans or deadlines for how the government will enforce and fund programs to eliminate lead poisoning. The newly announced plan would focus on reducing children's exposure to sources of lead, including dust and lead paint, identify and improve health outcomes for children exposed to lead, and support more research on efforts to reduce health risks related to lead. Top officials from the Environmental Protection Agency, Department of Health and Human Services, and Department of Housing and Urban Development announced the new federal strategy, which has been developed over the last few years. Federal officials who have worked on lead as an issue say the government needed to update its plan to take a more proactive approach, instead of treating children only after they were exposed to lead. The CDC says there is no safe level of exposure to lead for children. Since the Flint, Michigan, water crisis, cities around the country have been identifying lead contamination from aging pipes as well as ongoing issues with lead exposure from older buildings and public housing. Previous federal actions like banning lead paint have dramatically reduced the number of people exposed to lead, but the government says children in four million homes are still being exposed to high levels of lead and at least 500,000 young children have levels of lead that require intervention. 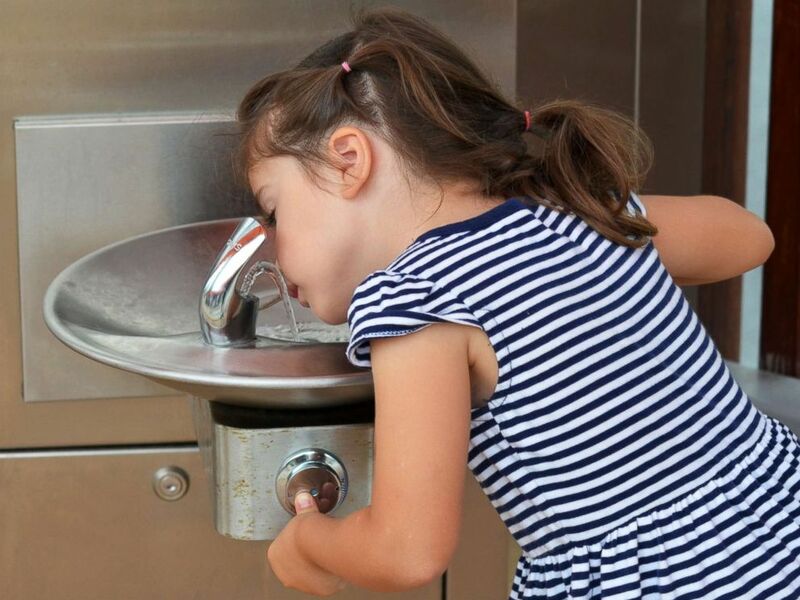 A girl drinks from a water fountain in an undated stock photo. The former head of the EPA Office of Children's Health has said the agency moved too slowly to address the important public health issue. That official, Dr. Ruth Etzel, was placed on leave earlier this year, which the agency said was to investigate unspecified allegations against her. But Etzel said it was because she had been pushing for the new strategy to be completed because she was concerned the Trump administration wouldn't support any new regulations on lead. Critics of the plan released this week said it reads more like a summary of previous reports on lead exposure but doesn't offer any new solutions. Acting EPA Administrator Andrew Wheeler said that even though the action plan doesn't include new rules on lead, the agency is moving forward with updates to the lead and copper rule that requires old pipes be replaces or treated to prevent lead from being released into the water. He also said the agency will complete regulations to limit lead in dust by next June. "We're moving forward on a number of regulatory programs to reduce lead exposure in homes," he said after the announcement on Wednesday. But Tom Neltner, director of the chemicals program for the nonprofit Environmental Defense Fund, said the new report doesn't specifically lay out those specifics, focusing instead on vague goals to reduce lead exposure. "It's very, very weak on enforcement and getting people to comply with the rules is an essential part of that. Unless you provide funding to the states where the work needs to happen we're not going to see a lot of progress," he said in an interview. Nelter serves on the EPA's children's health advisory board and has worked on lead poisoning prevention for years, including for the state of Indiana. He said most enforcement when it comes to lead will happen at the state or local level but the plan doesn't say how the federal government will find more money for those local programs. "Our current strategy assumes that the federal government is everywhere in the country enforcing this law. That hasn't happened, there isn't funding to do it," he said. He also pointed out that Trump administration's report sets goals to "reduce exposure" to lead, which he called a retreat from goals to "eliminate" lead poisoning by 2010, which was the strategy in the 2000 report. The previous report focused only on lead-based paint, while the new report includes more sources of lead exposure like food and drinking water. Wheeler said EPA will develop a plan to implement the goals in the report by March 2019.